2014 May « THE BRYCE IS RIGHT! – The answer should be rather obvious. These are indeed strange times. We now question not only America’s future, but its very existence. This is not the first time we have questioned our ability to carry on. The 1860’s, 1930’s and 1960’s were strange times in our country’s history, but somehow we held on and succeeded in spite of overwhelming odds against us. As the world’s melting pot, we are a culturally diversified society with a heterogeneous set of opinions and perspectives. Our customs, beliefs, and values are derived not just from the “old world” but from geographical idiosyncrasies as well; e.g., New England, the Mid-Atlantic states, the South, the Midwest, the Southwest, and the Northwest, each with their own indelible peculiarities which influences the behavior and opinion of the citizens. Getting the people of the United States to conform to a standard set of values, rules, and laws is not only incredibly difficult, it is nothing less than a miracle that we have lasted this long. First, Freedom – We were very fortunate to have a set of founding fathers with the foresight to develop an innovative Constitution and Bill of Rights which defines the checks and balances of government and establishes the unalienable rights we all enjoy as citizens. It is simply brilliant. Freedom allows us to express our creativity and imagination, encourages an entrepreneurial spirit, and promotes a free-enterprise system that stimulates the growth of the middle class representing the economic engine of our country (and the world). Without this engine, America would be no different than any other third world country. We have been fortunate to have had many people defend these rights over the years, both in and out of uniform, but perhaps no more than Abraham Lincoln who seemed to grasp the significance of what our forefathers were trying to do and, thankfully, preserved it for succeeding generations. I very much doubt we have anyone in our government today with the wisdom and vision needed to devise as sophisticated a document as the framers of the Constitution did over 200 years ago. Second, the People – who thrive under an environment of freedom. 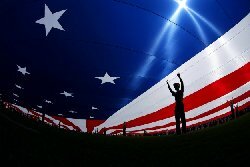 America is not just one people, it is several types of people operating under one umbrella. Both our strength and weakness lies in our cultural diversity. It brings many different perspectives, insights, and new ideas to the table, thus encouraging opportunity, competitiveness and invention on a global scale. It is because of this cultural mix that we only come together as a result of disaster; the rest of the time is spent arguing, finger pointing, and political wrangling. This is why Americans are typically better reactors as opposed to planners. If America has an Achilles’ Heel, it is that we tend to wait for disaster before we act; e.g., The Lusitania, Pearl Harbor, and 911. America succeeds not because of our government, but in spite of it. Without the blueprint of the Constitution and the Bill of Rights, our government would be more invasive in our lives than it already is. So, why do we succeed? Actually, I think it’s more than just dumb luck, but rather because the time was right to create a country like the United States, the need was real, and we were fortunate to have good and learned people who put it all together. As long as we believe in our Constitution and Bill of Rights, and do not deviate from them, and believe in ourselves, “We the people…” of America will succeed. NEXT UP: MAN VERSUS NUMBERS – How we are losing the common touch. LAST TIME: WHY YOUNG VOTERS ACCEPT OBAMA – How the next set of voters see America. – How the next set of voters see America. We are now in the sixth year of the Obama presidency and way past the point of blaming President Bush for everything from the economy to hang nails. A lot has happened during this period, the most noticeable of which is a slow, yet apparent, dismantling of the United States. Youth growing up in the age of Bush and Obama do not comprehend the greatness which characterized America; it is a foreign concept to them. They may not appreciate how we survived WW2, put a man on the moon, and became the industrial juggernaut of the world, but they will be voting in the next election and have no comprehension of what America once was and could be again. Our youngest voters do not understand the meaning of a massive and escalating debt, a growing welfare state, excessive spending, and a horrendously slow recovery. Since they have nothing to compare it to, they think this is the way things should be. Militarily, we have diminished our ability to fight. Historically, American policy for defense included the ability to fight in two arenas of operation, as in WW2 (Europe and Pacific). During the Obama administration this was changed to accommodate only one theater of war. Since WW2, America accepted and assumed a leadership role in military matters. Today, we “lead from behind.” To young voters who do not possess a sense of history, this appears to be perfectly normal. At one time, America was the leader of the space race. This all changed during the last six years where we no longer have a policy or major objective for space, and now depend on countries like Russia and China to allow us to hitchhike into space. Basically, we sacrificed our space initiatives for social programs. To our youth, names like Werner Von Braun, Alan Shepard, John Glenn, Gene Kranz, Neil Armstrong, Buzz Aldrin, and Michael Collins, have long been forgotten, as well as their accomplishments. Our young voters have only known of gridlock in Washington, DC. The president thwarting Congress through any and all means seems perfectly natural to them. Ronald Reagan, even in his day of conservative politics, found a way to work with a Democratic Congress, but not Mr. Obama, not unless you count the 11th hour attempts to raise the debt limit, something he, himself, repudiated when he was a Senator from Illinois. The legal system has changed vastly. The pretrial release system for processing prisoners puts public safety at risk and is aimed at eliminating the bail bond industry. Drug offenders and illegal immigrants today only get a slap on the wrist. The Commander-in-Chief enforces only those laws he feels is pertinent, least of all guarding our borders. And his Attorney General, the nation’s “top cop,” became the first AG in history to be held in both criminal and civil contempt. If our younger voters are not concerned, why should the rest of us? Our public educational system has changed from teaching and motivating students, to memorization and testing. Further, an educational bureaucracy is about to become more invasive in the lives of our children with the coming of Common Core. Youth, who have just experienced several years of such education, is now comfortable with this approach. Even the concept of capitalism, long an inherent part of the American free enterprise system, is under attack by the current administration. 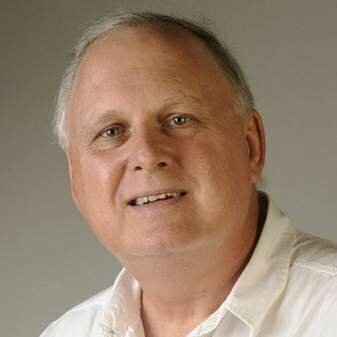 By creating a division between the “have’s” and the “have nots” and enacting legislation arresting the development of companies, such as the highest business tax rate in the world, the administration is creating a stifling business environment and moving the country closer to socialism. Young voters show no sympathy as they have been taught to view business, both big and small, as inherently evil. The division between Americans also seems perfectly normal. Even though it isn’t politically correct, the country has been divided along racial, sexist, and economic lines. The media becomes the judge, jury, and prosecutor in the court of public opinion. By doing so, it stays in lockstep with administration policies and positions. If they do not, journalists are immediately taken to the woodshed. 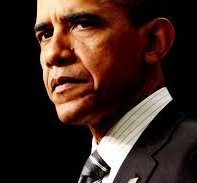 Some would claim President Obama is openly dismantling the United States and creating a massive bureaucracy to invade every aspect of our lives. Although studies show young voters do not necessarily trust Obama, they have been trained to accept his policies. This is how our next set of voters understand the world, not based on our past glory. To them, this is all perfectly natural and how they perceive politics working and business conducted. This does not bode well for the next election. If you are a concerned parent, it is time to discuss with them what capitalism is, the dignity of work as opposed to entitlement, the American Dream, the Constitution which explains how our government is supposed to work, and above all else, an understanding of our history. Don’t rely on the teachers or media to explain it as it is not in their best interest to do so; it is up to you, the parents, to set them straight. Do not abdicate your responsibility. Obama’s secret to dismantling America is not all of the devices mentioned above, but developing an apathetic generation of voters who will embrace Mr. Obama’s policies well into the 21st century. NEXT UP: WHY AMERICA SUCCEEDS – The answer should be rather obvious. LAST TIME: THE STUPIDS – Working with the public is not easy. – Working with the public is not easy. Shortly after graduating from high school I went to work at a large amusement park in Cincinnati for a summer where I ran the cable car ride. I had a lot of smaller jobs while in school, but this was the first where I was exposed to the public on a grand scale. The amusement park provided instructional materials to try and prepare employees in dealing with the public, but I don’t think anything truly prepares you for something like this other than to throw you right into it whereby you either sink or swim. I have to admit, dealing with the masses for the first time was an eye-opening experience and definitely not for the faint of heart. The public’s indiscretions and atrocities are truly mind-numbing as anyone who has ever worked at such a venue can tell you. While at the park, I saw motorcycle gangs, groups of transvestites, drunk hillbillies, etc., but it was Orphan Day at the park that finally pushed me over the edge. Basically, the park opened its doors to every orphan in the state of Ohio which, to me, seemed like releasing all of the animals from the zoo. The kids basically ran amok throughout the park un-chaperoned. In addition to just being pests, they endangered others on the rides, and frequently injured themselves. As I recall, the log-flume ride had more than its share of chopped off fingers from kids who wouldn’t listen to instruction and keep their hands inside the ride. 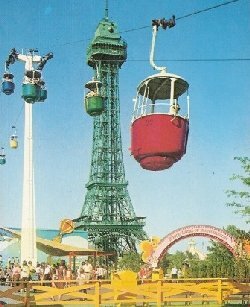 On more than one occasion they caused my cable-car ride to shut down by jumping up and down in the car during the ride. As an aside, seeing a cable car bounce up and down on a line like a pogo stick is a frightening sight. Bottom-line, Orphan Day was my last day of employment at the park. Recently, I was asked to help out at a major community event in my area. This was not just another rinky-dink arts and crafts festival, but rather a major outdoor event involving thousands of people. The particular group I was involved with was charged with directing parking and securing the entrances and exits to the event. As the human throngs invaded, I started to experience flashbacks to my amusement park days. 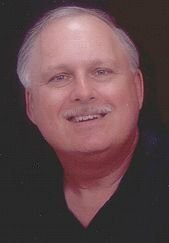 Instead of dealing with orphans, motorcycle gangs, etc., I was dealing with basic families and retirees. Interestingly, I discovered they suffered from the same case of “the stupids” as the wackos I had in Ohio, It thereby occurred to me that “the stupids” know no boundary and can be found just about anywhere involving large groups of people. * Sensory impairment, particularly sight and sound. It seems people cannot see the largest of signs, even when it is blinking in front of them. Further, they seem to become deaf when you are trying to give them instruction; either that or they seem to forget the English language and look at you like you are from another planet. * People become self-centered. Instead of trying to cooperate and wait their turn, they are more interested in pushing and shoving to the head of the line. When you try to correct them, they become belligerent, regardless of how polite you try to be. * People develop a herd mentality whereby they follow anyone wherever they are going, right or wrong, kind of like lemmings. 1. People have no common sense in massive settings and need to be told what to do, not just once but repetitively until it sinks in. 2. People prefer to be led and told what to do. They are more content if they know someone is watching over them. 3. People are easily manipulated using simple commands. If the message is complicated, the less likely they will understand and obey it. Short, simple commands are all that is necessary (and all that John Q. Public understands). If this all sounds like a cattle drive, it is, complete with park attendants who play the role of cowboys. Next time you visit an amusement park or political rally, observe how the masses are manipulated and you will see what I’m talking about. Just be careful not to spook the herd though, you might start a stampede. This is why you often hear soothing music at such venues, as it tends to calm people down (like the cowboy’s harmonica). NEXT UP: WHY YOUNG VOTERS ACCEPT OBAMA – How the next set of voters see America. 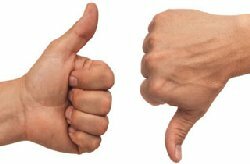 LAST TIME: EVALUATING EMPLOYEES AND MANAGEMENT – Two valuable forms for evaluating both management and the workers. – Two valuable forms for evaluating both management and the workers. It has long been customary in business to periodically evaluate employee performance, such as 30 days after hiring, or at regular intervals, such as annually or bi-annually. The purpose is to have the manager assess the employee’s strengths and weaknesses, and make recommendations for improvement. Such analysis can represent a source of consternation, particularly if it is a negative review, but the intent is to help the employee improve as a worker as opposed to assassinate his character. Reviewing an employee with malicious intent is just plain wrong, as is giving a rosy review, both are detrimental to communicating to the employee where they stand in the eyes of management and how they can improve themselves. A variety of “Employee Evaluation Forms” have been devised over the years to document the review. We have used the same form for many years and have found it to be particularly useful (you can download it HERE). There are two ways of implementing the form; first, by having the manager prepare the form and review it with the employee. The second, it to have both the manager and employee complete separate copies of the form and compare the two. Inevitably, a disparity in the answers will emerge which will differentiate the manager’s perspective versus the employee’s. I personally prefer the latter approach and recommend it to my clients as it will cause the employee to think about the discrepancies. I consider an “Employee Evaluation Form” an essential management tool regardless of the type or size of company, large or small. Such forms are also useful for keeping you out of employment lawsuits. If you prepare the form properly, and have the employee sign it to acknowledge its contents, the employee can never claim he/she was unaware a problem existed when terminated. I admonish employees not to take the employee evaluation personally. Regardless of what the manager says, learn from the experience, and do not dismiss it as irrelevant. It is one of the few times you can have a heart-to-heart talk with your boss on the record. Recognizing the benefits of the employee/manager comparison I devised a similar form to evaluate management, a “Management Evaluation Form.” If the employee is willing to succumb to a personal evaluation of his/her job performance, it seems reasonable to have the employees evaluate management thereby representing a “bottom-up” approach for evaluating a particular manager or management in general. Such a concept though is somewhat avant-garde and controversial in the world of business, but I think a good one. Not long ago, I reported on a recent Gallup study entitled, “Why Great Managers Are So Rare.” In it, Gallup found companies pick the wrong person as manager a whopping 82% of the time. So the need exists to consider the manager’s abilities. Like the employee version, the “Management Evaluation Form” should be performed routinely, but on a confidential basis. If you ask employees to identify themselves, it is unlikely an accurate analysis will be prepared as workers will tend to flatter the boss, as opposed to criticize, in fear for their jobs. As such, it defeats the purpose of the analysis. Therefore, they should be prepared anonymously, preferably with an outsider who has no axe to grind and can guide them through the evaluation. Under no circumstances should the employees be tricked into submitting an evaluation with secret embedded codes which will reveal their identity. This violates the confidentiality and ultimately severs trust between workers and management. After the forms are summarized, they are destroyed to prevent the analysis of handwriting. 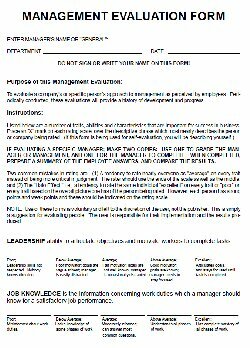 As in the employee version, the “Management Evaluation Form” is intended to provide sincere feedback to management for improving management and the work environment. It certainly should not be used as a form of payback. The form includes questions aimed at defining the manager’s style of management, his/her ability to motivate people, the corporate culture, and the manager’s ability to get things done. It considers such things as leadership, ethics, fairness, professionalism, housekeeping, personal appearance, knowledge of business and industry, and much more. 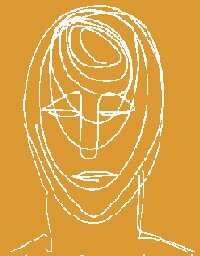 If a particular manager is being evaluated, he/she is asked to complete the form as well to define how they perceive their skills. This will be used for comparative purposes. After the forms have been completed, I summarize them and review the results with either the manager or the company management in general. Either way, the results prove to be most illuminating and causes management to rethink their policies and procedures. In some cases, it helps determine the need for additional management training. This analysis is useful for unearthing problems before they arise and provides management with an opportunity to address them. At the very least, management will understand the mood of the employees. It’s just plain good business to understand your management capabilities. The response to the “Management Evaluation Form” has been positive. Given a good understanding of the purpose of the form and resulting analysis, this becomes as beneficial as the “Employee Evaluation Form,” maybe more so as it tends to promote trust between management and workers. Both forms are valuable management tools for improving the corporate culture, the employee, and the manager. Again, I admonish the subject of the evaluation to take a cool and careful look at the results and try to put it in perspective. Do not get angry if the results do not turn out as you expected, as they usually do not. Instead, try to understand why the answers were different and how you can improve yourself. If you are interested in trying the “Management Evaluation Form,” please do not hesitate to contact me for consulting. NEXT UP: THE STUPIDS – Working with the public is not easy. PRE OR POST DOCUMENTATION, WHICH DO YOU PREFER? In addition to my essays, I have written a considerable amount of documentation for business and systems over the years; everything from Policy Manuals and proposals, to Feasibility Studies, Systems Documentation, Test Plans, software specifications, User Manuals, and Audits for systems and projects. I find such work relatively easy, but I am always amazed by those clients who really do not grasp the significance of technical documentation. It is not uncommon to be asked to come in afterwards and provide a description of the newly created system and software. This is considered post-documentation whereby you test the system to see what it is capable of doing, and writing the supporting documentation. I have always considered post-documentation to be backwards. 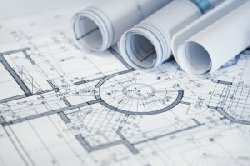 It is analogous to asking an architect to draw the blueprints of a skyscraper after it has been built. In other words, I’m a proponent of pre-documentation whereby flowcharts and text are used to record design decisions in the same manner as architects and engineers, in layers whereby you go top-down from the general to the specific. Under this approach, your documentation is completed before programmers begin to write the source code. The same is true where the architect finishes the blueprints before digging the first shovel of dirt. Call me old-fashioned, but I have never seen this approach fail. Some programmers consider documentation a waste of time (see “Agile programming”), even going so far as to claim it is detrimental to productivity. Instead of getting all the software specifications recorded on paper at the start, they prefer to begin hacking on the program code and keep modifying it until the end-user is satisfied. Someone is then called in to figure out what the software does and write the documentation (post-doc). Imagine two separate software project teams given the same assignment, one uses a pre-documentation approach, the other post-documentation. From start-to-end, which team do you believe will finish first? The pre-doc group will seem to take considerable time up-front documenting the specifications. However, the programmers should spend nominal time interpreting the specs and writing the programs. When the programming is done, the project is done as the documentation was completed beforehand. In contrast, the post-doc group will begin programming almost immediately. Yet, because the specifications were incomplete and fraught with misinterpretations, they will inevitably have to rewrite the programs over and over again until they produce something remotely usable to the customer. Finally, they call in someone to write the documentation. Obviously, the post-doc approach represents a more costly expenditure requiring more time to complete. Programmers appreciate the need for documentation but rationalize, “We do not have time to do it right.” Translation: “We have plenty of time to do it wrong.” Consequently, they abhor the concept of documentation in any form and resist any and all attempts for them to produce it. I guess I should be thankful for those embracing post-documentation. If everyone was doing it properly, I wouldn’t have too many technical writing opportunities. NEXT UP: EVALUATING EMPLOYEES AND MANAGEMENT – Two valuable forms for evaluating both management and the workers. LAST TIME: SCIENTIFIC FLIP-FLOPS – What is good for us? Scientists really do not know. – What is good for us? Scientists really do not know. Something that has irritated me for a long time is how scientists change their minds on such things as food and drugs. Whereas, something today may be touted as good, tomorrow it might be discovered it is actually bad, or vice versa. This can be very confusing and puts the credibility of scientists into question. So much so, we no longer know who to believe. To illustrate, it was recently reported that vitamin supplements were a waste of time and simple natural foods provide better nutrition. Consider how many years we’ve been taking “One A Day,” “Chocks,” “Flintstones Vitamins,” “Centrum,” and dozens of other pills. We’ve been consuming pills for Vitamins A-E, K, Fish Oil, Magnesium, Zinc, and God knows what else since time immemorial it seems. Do you mean to tell me this was only good for lining the pockets of the drug companies? Please say it is not so. For years, we heard how coffee is bad for you, that the caffeine will ultimately kill us by attacking our hearts and nervous systems. This led to the advent of decaffeinated coffee, the “Tab” of the coffee industry with about the same rotten taste. Now we are being told coffee is good for us. In a recent study by the University of Scranton (PA), it was discovered coffee is the number one source of antioxidants. There is also evidence it reduces the risk of Type 2 Diabetes, Alzheimer’s, and even prostate cancer. It appears a light roast is better for you than a dark roast which may burn off the antioxidants, and you should avoid cream and sugar. I’m just grateful I never gave up my black unleaded version of Chock Full O’ Nuts. As I grew up, it was preached Marijuana was bad for us. Since the 1960’s though, few seemed to have listened, including our Commander-in-Chief who claimed it was “no worse than alcohol.” Then a movement began touting the virtues of Medicinal Marijuana. In a recent post, I mentioned it has questionable medicinal benefits. Shortly afterwards, a research report was published by Northwestern University and Massachusetts General Hospital/Harvard Medical School, in the “Journal of Neuroscience.” Their research, “suggests young adults who smoke marijuana at least once a week have altered areas of the brain involved in emotion and motivation.” This was closely followed by another report in the Journal of the American Heart Association stating “marijuana use may result in cardiovascular-related complications — even death — among young and middle-aged adults.” Further, a report by the National Institute on Drug Abuse found that “marijuana use makes tobacco use more pleasurable and may increase the user’s risk for becoming addicted to nicotine.” So, surprise-surprise, it is considered bad again and will likely hinder plans to legalize marijuana. I wonder how the anti-tobacco lobby, who advocates marijuana, will react to this. Alcohol has also had good and bad reviews for many years. On the negative, it has been blamed for a litany of diseases, not to mention drunkenness. On the plus side though, it was recently reported that drinking wine in moderation can be good for you. In a story unrelated to nutrition, a new research study, published in the Journal of “Nature Climate Change,” and paid for by the federal government, produced the startling fact that Bio-fuels (e.g., Ethanol) create more carbon emissions than fossil fuels (as much as a 7% more than gasoline). This revelation flies in the face of the government’s support of bio-fuels. So what will the government and oil companies do; eliminate Ethanol and increase gas production, or continue to pollute the planet? Last but not least, there is the issue of Tobacco which has been under scrutiny for the last fifty years. Interestingly, a recent report from Australia reveals there is a molecule in tobacco plants found to be useful in killing cancerous cells in humans. Then there is a report from Vanderbilt University’s Center for Cognitive Medicine which finds nicotine is safe, even helpful in combating Alzheimer’s and Parkinson’s Disease. Hmm, let me see if I’ve got this right; if I smoke marijuana, I’ll want to smoke more tobacco, and the nicotine from the tobacco will keep me alert, steady, and will help me with my fight against cancer. I can see the tobacco companies drooling now. This vignette says a lot about the flip-flopping by scientists. It also says a lot about the government grants to pay for such research. It seems the scientists have to produce something, anything, to justify their research. Frankly, I have trouble believing them anymore and will proceed without the vitamin pills, while enjoying a good cup of coffee and cigar. In other words, until such time scientists can authoritatively prove their research, once and for all, tell the scientists to leave us alone. LAST TIME: AMERICAN INVENTIONS – How technology changed the country and the world. – How technology changed the country and the world. If you were to ask young people what they consider the most influential inventions that affected America, they would likely respond with the PC, Apple’s iPhone and iPad, or perhaps the new Google Glasses. This reflects the erosion of our sense of history. I would argue even though these inventions are interesting, their development was inevitable and the natural byproduct of earlier inventions. Understanding America requires more than just the memorization of important dates, such as 1776, but also the inventions we created along the way. Our inventions ultimately dictate who we are, for they were devised to solve particular problems and to remain competitive in the world community. They also reflect our resourcefulness and determination to get things done by rising above the status quo. For historical purposes, I have assembled the following list of arguably the greatest American inventions. These ideas and devices not only impacted our country but the world at large. In addition to enhancing productivity and business, they also influenced our society. There are far too many significant inventions to list here. Instead I was interested in identifying those which had a profound effect not just on business, but socially as well. For example, Franklin’s lightning rod was useful for curbing lightning strikes and ensuing fires, but it did not affect the social conscious of the nation. Eli Whitney’s cotton gin greatly enhanced the output of cotton in the South, but it also encouraged a dependency on slavery and contributed to the outbreak of the American Civil War. There were many others, but I wish to point out those which positively influenced the American character. Steam Engine (1781) – True, the first steam engines were introduced in Spain and England in the 17th century, but it was James Watt’s engine that provided the first practical implementation which would be used in railroads, ships, and other manufacturing and agricultural applications thereby becoming an important cog in the Industrial Revolution. In addition to improving output, the steam engine improved transportation, thereby making us a more mobile society by connecting the country. Train service also improved communications by expediting mail service. These effects would later be emulated by the introduction of the internal combustion engine. Morse Code (1836) – The electric telegraph was another invention derived from Europe and preceded by the optical telegraph (signalling). The first practical implementation though came in 1844 with the first long-range telegraph between Baltimore and Washington, DC where inventor Samuel F.B. Morse sent the famous expression, “What hath God wrought,” a phrase from the Bible’s Book of Numbers. This was all made possible through the use of Morse Code, a standard system of dots and dashes which transmitted text messages. In reality, Morse Code was invented by Morse, American physicist Joseph Henry, and machinist Alfred Vail. This system revolutionized communications. Messages and news could be easily disseminated in seconds as opposed to days. This kept the public informed of current events and allowed business decisions to be made more readily. The Trans-Atlantic Cable bridged North America with Europe, thanks to Morse’s standard language. The telegraph may be long gone, but Morse Code lives on through Ham Radio operators. Remarkably, the system is still faster than newer techniques, such as text messaging. Baseball (1845) – although historians argue over the origin of the game, baseball’s roots were likely derived from “rounders” in England. Nevertheless, the rules and game of baseball are uniquely American. The beauty of it is just about anyone can play it, assuming you can run, catch, throw, and swing a bat. It is also a thinking game with subtle strategy and secret communications, thereby making it an ideal spectator sport. Unlike other games played on a rectangle and scoring by taking a ball or puck to an end zone or net, baseball is played on a “diamond” which is actually a field defined by a 90 degree angle. To the outsider who has never played the game, baseball seems confusing at first, but with a little patience, the quirks of the game can be quickly learned. Because of its popularity, baseball has been dubbed America’s “National Pastime,” and a welcome diversion from the tedium of life. Aside from the United States, it has become popular in Central and South Americas, Japan, China, Australia, Europe, and elsewhere. Telephone (1876) – Alexander Graham Bell was awarded the first patent for the electric telephone in 1876. As with other technologies listed here, others were active in its development, but Bell was first. The telephone revolutionized communications not only in America but throughout the world. Whereas phones were originally placed in a key location in a town, it propagated to households and businesses, and eventually to just about every individual on the planet. A boon to communications, the telephone also affected the populace socially. For example, the phone has been an indispensable tool for teenagers for many years and was likely the driving force for developing the “smart phones” of today. Phonograph (1877) – Thomas Edison’s “talking machine” provided a handy tool to entertain people who were not proficient in the use of a musical instrument. Interestingly, the cylinders of Edison’s machine ultimately became the hard drives of today’s computers and smart phones, all based on circular devices for storing and retrieving data. Radio (1885) – Again, experiments were conducted earlier, but it was Edison who received the first radio patent. For a long time, radio was the principal means of communicating with the public. It revolutionized news reporting and entertained the public. More importantly, it introduced the technology which would ultimately be used for television, radar, and today’s cell phone towers. Tabulating Machine (1890) – Herman Hollerith is credited with inventing the tabulator using punched cards. This was fostered by the 1890 census which was desperately in need of a better approach for counting. Hollerith’s invention not only proved useful for the US Bureau of the Census, but for business in general. It was the precursor of the modern day computer and was eventually used for accounting, inventory, and just about anything requiring counting. The machine also gave birth to a new company which would influence technology and business for years to come, IBM. Tabulating machines were used until the 1950’s when the computer finally replaced them. Electric Power Distribution (1882) – although Edison did not create the light bulb, he invented the first power grid in New York City to use his electric lamps, thereby turning the darkness of night into light (Pearl Street in Manhattan). The effect was dazzling and changed our social life at night. Candle power was no match for Edison’s electric grid, something that is with us to this day. Assembly Line (1901) – the concept of routine assembly using standard parts has been around for centuries, but it took Henry Ford to mechanize it to produce his line of automobiles, thereby revolutionizing the process of manufacturing. This is one of the most important concepts to emerge from the Industrial Revolution. It’s been used to produce everything from automobiles and airplanes to a multitude of electronic devices and just about every consumer related product imaginable, including the smart phone. By doing so, the assembly line made it possible to make products affordable for just about everyone, thereby creating a middle class. Air Conditioning (1902) – Willis Carrier was the inventor of “electromechanical cooling” which was originally intended for companies with products requiring climate control, such as printing, photography, and chemicals. This technology was eventually used for general business comfort, as well as in automobiles and homes. The air conditioner had particularly affected the South where temperatures during the summer would prohibit work and sleep. The advent of the air conditioner was a major contributor to people migrating to the South, including yours truly. Airplane (1903) – The Wright Brothers are credited for “the first sustained and controlled heavier-than-air powered flight.” Like the Steam Engine, it had a profound effect on transportation and communications, although it devastated passenger rail service. By conquering the sky, we made the world a smaller place to live, accessible to just about anyone. It has helped forge business relationships overseas, thereby improving commerce, and made America more aware of the world around us. Credit Card (1950) – the credit card traces its roots back to air travel cards which would allow you to “buy now, pay later.” The Diners Card became the first charge card, which was quickly followed by Carte Blanche and American Express in the 1950’s. BankAmericard, which would evolve into Visa, would follow, as would Master Card, and Discover Card much later. Prior to this, the concept of paying for merchandise with anything other than cash was unimaginable. Today it is just the opposite as most transactions are recorded by credit cards. Its only drawback is that it is probably the single most significant cause for people to go into debt by over spending. 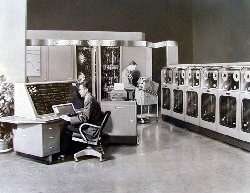 Computer (1951) – I realize people will argue the ENIAC was the first computer as commissioned by the US Army in the closing days of World War II, but it was the UNIVAC I (UNIVersal Automatic Computer) which became the first computer to be used for commercial purposes. Both machines were invented by J. Presper Eckert and John Mauchly, two pioneers who exhibited great foresight into the world of computing for many years. The product they produced set the stage for super computing and mini computing, ultimately leading to the smart phone, the PC, and the Mac. Without the likes of Eckert and Mauchly, there would not have been a Bill Gates or Steve Jobs. The computer has touched our lives like no other machine before or since. It is probably impossible to think of an industry or person who remains unaffected by the computer. Internet (1969) – This was developed as a project for the Department of Defense to communicate with universities and research institutions. Today, it is the lifeline we all use for e-mail and to traverse the world wide web. It is also used to purchase merchandise, send/receive phone calls, transmit live photographic images, secure our homes, search for a mate, social networking, and more. And, No, Al Gore most definitely did not invent the Internet (he was 21 at the time and still in school). U.S. Constitution (adopted 1787, ratified 1789) – This is perhaps the most brilliant invention in our history. Some would argue it is not unique. True, many of the concepts were derived from earlier political philosophers (e.g., Sir Edward Coke, William Blackstone and France’s Montesquieu, not to mention the Magna Carta), but the Constitution was the first practical implementation of such ideas. Fortunately, the authors of the Constitution were well versed in history and political philosophy, including the ancient Greeks and Roman empire. What makes the Constitution unique is its three separate but equal branches of government, its checks and balances, its bicameral system of Congress (two chambers), to act as a Republic as opposed to pure Democracy, and the Bill of Rights which enumerates the rights of American citizens. They were also wise enough to make it modifiable, so revisions could be added. James Madison was the principal author of the Constitution and would later serve as our country’s fourth president. Madison and his Virginia colleagues came to the Constitutional Convention prepared and introduced the “Virginia Plan” which served as a template for the Constitution. The Constitution superseded the Articles of Confederation and Perpetual Union which was our first governing document produced shortly after the Declaration of Independence. Whereas the Articles of Confederation simply stipulated how the various states would work together, the Constitution was to be more definitive in terms of devising a federal government. It took two years for the Constitution to be ratified by the thirteen states, a miracle in itself. The “Federalist Papers” were written and distributed to explain the rationale for the various parts of the Constitution, thereby selling the idea to the country. The fact the U.S. Constitution has stood the test of time (225 years) and survived a bloody Civil War is a testament to its merit. It has also been emulated by states in the union and other countries, including Mexico and the Philippines. So brilliant is the document, I cannot imagine today’s Congressmen as being able to devise anything remotely better. As an aside, it is the Constitution which includes the provision for protecting intellectual property such as the inventions listed here (Article One, Section 8). Without such protection, our volume of inventions would be much less. All of these devices have had a deep-seated effect on the American character. It defines who we are, what our values are, how we conduct business, and how we socialize as a people. We must recognize for every new invention we can expect some sort of social adjustment or change in our perspective or thinking and, with rare exception, there will likely be legislation enacted to control and tax its use. Make no mistake, we have been influenced by our technology since the founding of this country, and way before. As such, it is important to remember when these inventions were created, the people who invented them, but more importantly the rationale for their creation. Without a sense of history, we would likely not understand the direction of where our technology and world should be heading. NEXT UP: SCIENTIFIC FLIP-FLOPS – What is good for us? Scientists really do not know. LAST TIME: WHY WE RESIST STANDARDS – An explanation why Common Core will fail. – An explanation why Common Core will fail. Coming from the Information Technology industry, I have witnessed many attempts at standardization, but most fizzled out before they could take hold as the I.T. field is a cut-throat territorial type of industry where companies try to dominate each other. To illustrate, the concept of the COBOL programming language was to provide a common business oriented language which could be standardized on the various computer platforms of the day. To computer hardware manufacturers, COBOL represented a threat to their existence, thereby providing a means to move from one computer platform to another. Consequently, each computer vendor devised their own interpretation of COBOL and implemented it accordingly. The result, standardization was rebuffed and the opportunity to share program source code over multiple platforms was denied. The only true standard I’ve seen in the I.T. field was the creation of ASCII code by Robert W. Bemer (American Standard Code for Information Interchange). ASCII represents the standard letters, numbers and punctuation symbols to be used for encoding computer instructions. Without it, there would not be any form of COBOL or other programming languages, and we would have likely not heard of people like Bill Gates and Steve Jobs. Standardization offers the benefits of uniformity, predictability, interchangeability, and harmony. If this is not of interest to you, than there is little point in trying to participate in a standards program. However, if you do wish to participate, understand there is more to implementing standards than simply saying, “that’s just how it is going to be done.” There has to be some sound rationale for their governance. In addition, you must address the enforcement issue. Standards will be adhered to by the degree of discipline instilled in the people charged with implementing them. If well disciplined, your chances for success are good, but if discipline is lax, automation is required to assure standards are being followed. Another problem is changing standards on a whim. For example, Freemasons have been practicing their Craft for hundreds of years all over the world. Yet, each jurisdiction, which is normally based on a geographical boundary such as a state or province, has their own unique way of operating which is rarely compatible with others. The principles may be the same, but the physical implementation is different. Of all people, you would think the ancient order of Freemasons, which has been around for hundreds of years, would have such standards. Surprisingly, they do not. And yet they continue to change their rituals on an annual basis. I never understood this. Now the country is embroiled in a standards initiative for educating our youth, specifically the Common Core State Standards Initiative. At first, the concept of education standards was warmly received by most of the states, but now a revolt is in the offing as states are beginning to question the validity of the Common Core standards. More than anything, the cause for the disillusionment is suspicion of the physical implementation of the program, which has dragged on too long and is producing seemingly questionable techniques for teaching key concepts, particularly in the area of math. Some of this may be legitimate criticisms, and some may be based on misinterpretation, nevertheless the government is doing a pathetic job of implementing and selling it to the public, hence more states are withdrawing from the program and it will likely be implemented on a state by state basis, just like the Masons. Besides, I’ve never seen a government standards initiative that ever bore fruit. So, why do we resist standards? Three reasons; We tend to encourage rugged individualism as opposed to teamwork; our tendency to be unique makes us suspicious of the motives of the people developing standards, and; we question the physical implementation of standards, whether or not we can truly realize an honest and consistent approach. In the case of Common Core, the government has dropped the ball in all three areas, as they have done time and again in other initiatives. The only way standards can be adopted in this country is to prove they are absolutely necessary. In the case of Bemer’s ASCII code, yes it was necessary. COBOL was perceived as a good idea, but certainly not something mandatory in nature. Consequently, multiple interpretations were devised, and I believe this is the direction Common Core is heading. Unless it is perceived as something we absolutely need to do, I’m afraid Common Core will go the way of the metric system in this country. NEXT UP: AMERICAN INVENTIONS – How technology changed the country and the world. LAST TIME: PENNY WISE, POUND FOOLISH – If you are going to be cheap, be prepared reciprocal measures. This is a very old expression which suggests someone is thrifty with small things, but spends extravagantly on big-ticket items, which, on the surface, appears to be incompatible approaches for managing finances. Yet, this is a philosophy commonly found in a lot of Fortune 500 companies. For example, a manager may have just paid a hundred thousand dollars for his department to take a training program, yet sharply criticizes one of his students who put a cup of coffee on his expense account. Let me give you another example, perhaps something you’ve run across yourself. Some time ago we had a large corporate account who had no problem paying a sizable sum of money for our product line. As part of the contract, each corporate division paid a modest fee for an annual maintenance contract. Dutifully, we would issue invoices prior to the anniversary date with terms of “Net Due in 30 days” (meaning the anniversary date). Interestingly, we noticed all of the invoices were being paid past their due date, 15 days later to be exact. In other words, they took the “Net 30” and tried to turn it into “Net 45.” We were told by an insider that this was a common tactic used by the company to make interest off the money being held for a few days longer. When we objected to the bills not being paid on time, the company tried to throw their weight around and asked if we would like to lose their sizable business. A lot of companies would back down in this situation, but we tried a different tactic; instead of issuing the bills 30 days prior to the anniversary date, we sent them 60 days prior to the date, yet sill marked “Net 30 Days.” As expected, the company paid the bills within 45 days, thinking they had once again outfoxed us. In reality, we received the money 15 days earlier than normal, and nobody was the wiser. All of this could have been avoided had they simply paid their bills on time as they were supposed to, but being a huge conglomerate they thought they could bully their way past the little guy. They never figured the little guy would be able to interpret their “penny wise, pound foolish” tactic and find a suitable solution. 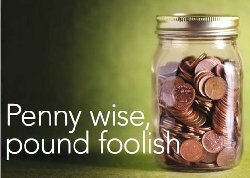 With a mindset like “penny wise, pound foolish,” be prepared for reciprocal measures. NEXT UP: WHY WE RESIST STANDARDS – An explanation why Common Core will fail. LAST TIME: DRAWING THE LINES – What the Nevada showdown teaches us about the future. – What the Nevada showdown teaches us about the future. The showdown last month in Nevada between rancher Clive Bundy and the Bureau of Land Management (BLM) was a genuine flashpoint in our history. On the one side was the federal government as represented by the BLM, and on the other was Bundy joined by fellow ranchers and supporters who have had enough of government intervention in their lives. The BLM was heavily armed, the Bundy side not so much but firearms were present and sharpshooters placed in strategic positions. Neither side wanted to pull the trigger and fortunately it ended peacefully, but it could have easily turned ugly. The government finally backed off fearing another Ruby Ridge or Waco Siege which was a public relations nightmare for the government. Regardless of which side you supported, the Nevada showdown ultimately teaches us this is a situation likely to be replicated in other government related confrontations. We saw signs of this emerging during last year’s Government Shutdown whereby federal parks were closed to the public, including the National World War II Memorial in Washington, DC. This did not sit well with veterans who defiantly tore down barriers in order to visit the memorial. What we are witnessing is a strong rebuff of the concept of Big Government as illustrated by the Bundy faction, the veterans visiting the WW2 Memorial, and, of course, the Tea Party. So far, these factions have demonstrated non-violent protests. The fear though is that an armed confrontation will occur and a gun will be discharged thereby triggering another “shot heard around the world,” which will be just as significant as the one fired in the Battle of Bunker Hill in 1775. Historians are still not certain who pulled the first trigger, but does it really matter? People of opposite ideologues were killed. The same is true today. The difference is the government is not simply facing some religious zealots with foreign attachments. All are portrayed as hard working, God-fearing patriots who possess a deep-seeded belief in the United States Constitution. 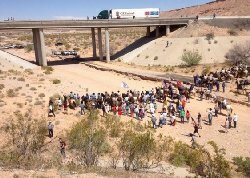 To illustrate, before facing the BLM in Nevada, the Bundy contingency stopped to pray for divine guidance, and carried the Stars and Stripes into the fray. The patriots simply believe the federal government has become too big and invasive in the lives of the citizens. Consequently, they are frustrated and feel bound not to tolerate it any longer. Now, using the Nevada showdown as a template, other groups are willing to go face-to-face with the federal government, including the State of Texas and the Oklahoma Militia who is warning the BLM not to use similar tactics in their states. The biggest concern though is whether someone from either side will pull the trigger and cause a bloodbath thereby providing a catalyst for armed insurrection. Interestingly, media coverage of the Nevada Showdown was spotty at best. Whereas the main street media tended to ignore the standoff, Fox News seemed to be the only television network covering it. In response to the incident, MSNBC described the Bundy group as “insurgents,” and Senator Harry Reid of Nevada verbally chastised the Bundy group as “Domestic Terrorists,” thereby implanting another wedge between left and right. Now the Senator’s credibility has come under scrutiny as to his role in the use of the BLM land. Whichever side you believe, it is immaterial. More importantly, we will likely face another flashpoint between the federal government and its citizens in the not too distant future. The mood of the country is divided along ideological lines, racial lines, moral lines, and socioeconomics (workers versus people dependent on entitlements). As such, it is the perfect set of circumstances to set off another Bunker Hill, or Bunkerville, Nevada. God help us all if this happens, but it is inevitable. The shaft we raise to them and thee. NEXT UP: PENNY WISE, POUND FOOLISH – If you are going to be cheap, be prepared reciprocal measures. LAST TIME: WHEN A TRUST IS BROKEN – What should you do? Forgive or reciprocate?